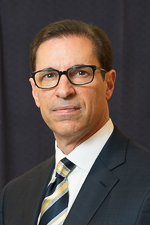 Leonard M. Rosenberg is a Partner/Director and Co-Chair of the Litigation and Arbitration practice group at Garfunkel Wild, P.C., which he joined in 1985. Mr. Rosenberg is also Co-Chair of the firm’s Appellate Litigation and Employment Law practice groups, and a member of the firm’s Health Care practice group. Mr. Rosenberg represents and counsels clients in federal and state court civil and administrative trials, appeals, arbitrations, hearings, and mediations. His practice includes litigation of a wide variety of health care, regulatory, commercial and business issues, including contract disputes, managed care audits, directors and officers insurance coverage disputes, and judicial review of agency and other administrative determinations. Mr. Rosenberg’s health care practice includes over 30 years of experience representing hospitals, physicians, medical boards and trustees in medical staff credentialing and peer review matters, including intra-hospital hearings and appeals, proceedings before the New York State Public Health council, and litigation arising from the peer review process. Mr. Rosenberg also counsels and represents physicians in professional conduct proceedings before the New York State Department of Health, Office of Professional Medical Conduct (OPMC). Mr. Rosenberg also has a broad employment law practice, defending clients against all types of employment claims, including age, race, gender, national origin, and harassment, as well as claims under the Americans With Disabilities Act, Family and Medical Leave Act, Fair Labor Standards Act, False Claims Act, whistleblower laws, wrongful discharge, breach of employment contract, defamation, and non-compete/restrictive covenant agreements. Mr. Rosenberg is the editor of “In The New York State Courts,” a summary of recent court decisions in health care law. The column is a regular feature of the Health Law Journal published by the Health Law Section of the New York State Bar Association, of which Mr. Rosenberg is a sustaining member. Mr. Rosenberg is also Vice Chair of the Editorial Board of The Health Lawyer, a journal published by the Health Law Section of the American Bar Association, and Vice Chair of Programming of the Section’s Health Care Litigation and Risk Management Interest Group. Mr. Rosenberg received his undergraduate degree from Cornell University in 1976, and his J.D. from Boston University School of Law in 1979. Prior to joining the firm, Mr. Rosenberg served as an Assistant District Attorney in Kings County, New York.